We value our waterways. Surface water quality is essential for supporting ecosystems, recreation, cultural values and the health of residents. Minimum water flows in streams and rivers are necessary to protect the health of waterways and safeguard drinking water supplies. Our storm water drains empty into rivers and streams. Storm water runoff is the chief driver of water quality in urban areas. Council is committed to improve our practices and lead by example to reduce pollutants getting into our waterways. A number of storm water management plans seek to manage surface water and drainage issues. Education campaigns are planned to show how the community can work together to improve our waterways. 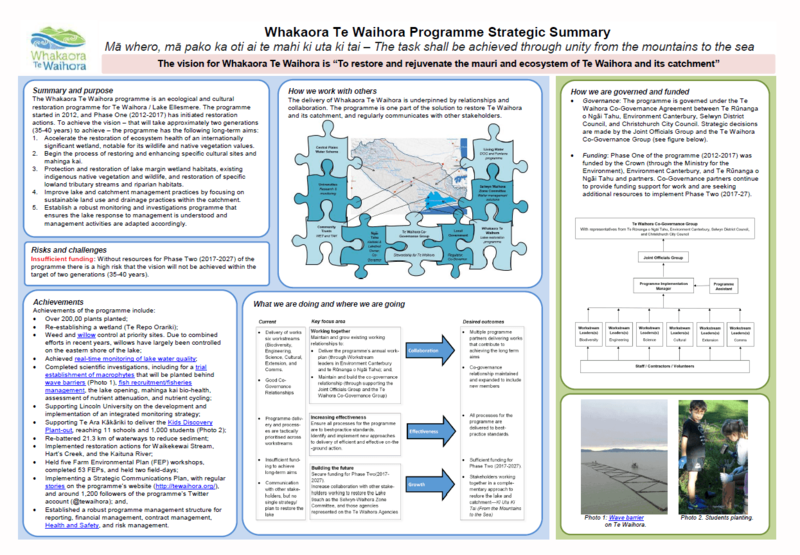 Council is a co-governor of the Whakaora Te Waihora (Lake Ellesmere) programme (external link)which seeks to improve water quality and restore significant cultural sites and mahinga kai in the area. Keeping toxins out of storm water is one of the best ways to help water quality in our streams. Ask your mechanic about switching to copper-free brake pads next time they need replacing. Copper from brake pads gets washed off roads and into drains which then pollute waterways. Wash your car on the lawn rather than on the driveway to avoid detergent running into the drains. Pick up rubbish you see near waterways to stop it blowing into the water. If your old zinc roof needs replacing, use different products that avoid zinc runoff into our drains and waterways. Since 2013 fewer water quality sites are rated as poor and more have moved to the fair category of the Council's water quality index. In 2017, 40% had ‘poor' water quality, 40% had ‘fair’ water quality and 19% of sites had ‘good’ water quality. Further information. Around half the sites sampled had poor or very poor water quality, while the proportion with good or very good water quality has decreased. Further information. Lake Forsyth/Te Roto o Wairewa and Lake Ellesmere/ Te Waihora both have very poor water quality and are considered supertrophic. Lake Forsyth/Te Roto o Wairewa looks to be improving. Further information. All beaches in Christchurch, Lyttelton and Banks Peninsula were considered suitable for contact recreation over the 2016/17 summer. 57% of sites in the Avon Heathcote Estuary and 25% of river or lake sites in urban Christchurch were considered suitable. Further information. Since 2013 fewer sites are rated as poor and more have moved to the fair category of the Council's water quality index (WQI). In 2017, 40% were rated as having poor water quality, 40% fair, and 19% of sites had good water quality. No site had very good water quality, as guidelines were exceeded on at least one occasion at all sites. No site recorded very poor water quality. The Ōpāwaho/ Heathcote River and Linwood Canal catchments generally had poor water quality. All other catchments generally had fair to good water quality. The Ōtūkaikino River recorded the best water quality out of all the catchments and the Ōpāwaho/Heathcote River catchment recorded the worst water quality, with the 11 worst sites all being from this catchment. The best site for water quality was tied between the Ōtūkaikino River at Groynes Inlet and Waimairi Stream, followed by Wairarapa Stream in second, and the Avon River at Carlton Mill Corner and Avon River at Mona Vale tied for third. The worst site for water quality was at the Haytons Stream retention basin, followed by Curletts Road Stream at the Motorway and Curletts Road Stream upstream of Heathcote River. The Ōtākaro/ Avon River has showed an improvement in WQI over time, with the median WQI moving from the poor to good in 2016 and then back down to fair in 2017. The Ōpāwaho/ Heathcote River has shown no improvement in WQI over time, with the median WQI always within the poor category. In the last two monitoring years the Huritini/ Halswell River has shown an improvement compared to previous years, with the median WQI moving from the poor to fair in 2017. The Pūharakekenui/ Styx catchment generally recorded an improvement over time, with the median WQI moving from poor to fair. The Ōtūkaikino River has been variable with the median WQI moving between the poor and very good categories. The Linwood Canal has shown some improvements over time, with the median WQI predominantly in the poor category. Note the Huritini/ Halswell River, Ōtūkaikino River and Linwood Canal have a small number of sampling sites (three or less) and as a consequence the monitoring may not provide a fair reflection of catchment water quality. Water quality at 11 sampling sites in the Avon-Heathcote Estuary/Ihutai declined between 2014 and 2016, with the number of sites having good or very good water quality decreasing from 45% to 18% (from 5 to 2 sites out of 11). This has resulted in an increase in the number of sites classed as fair. The proportion of sites classed as poor or very poor has been around 45% to 55% (5 to 6 sites out of 11). Sites located closest to the sea tend to have better water quality than those closest to the rivers and streams discharging into the estuary. Note, this is based on just 3 years of data, so it is not known if this is a trend in declining water quality or just normal fluctuations. Lake Ellesmere / Te Waihora and Lake Forsyth/ Te Roto o Wairewa have very poor water quality and are considered supertrophic (saturated in phosphorus and nitrogen). Lake Forsyth/ Te Roto o Wairewa has generally had improved water quality since 2010, however it is still classed as very poor quality. Since 2012, all beaches in Christchurch, Lyttelton Harbour and Banks Peninsula have been rated as suitable for contact recreation, such as swimming, during the summer period(November to March). Only one of the four rivers or lakes sites in urban Christchurch was considered suitable for contact recreation, and this was Lake Roto Kohatu. The Avon-Heathcote Estuary/Ihutai between the summers of 2012/13 and 2014/15 had 83% of sites assessed as suitable for contact recreation. This declined to 67% the following summer, before declining again to 57% in 2016/17 when an additional site was added. If this site was excluded, the proportion of sites would stay at 67%. Council Surface Water Monitoring Reports: Water quality trend information and water quality index are from the latest report for the 2017 calendar year. River catchment vision and values: These documents summarise the current status of, and key issues within, river catchments relative to the Council’s six values of waterway asset management: ecology, drainage, culture, heritage, landscape and recreation. They provide examples of surface water management approaches, or options available that might be implemented to as part of the stormwater management plans. Environment Canterbury Water website(external link):(external link) Contains reporting on the water quality and ecosystem health of waterways and the coast of Canterbury including reports on Avon-Heathcote Estuary/Ihutai. Land and Water Aotearoa website:(external link) Information on water monitoring sites for New Zealand including water quality, swimming water quality, air quality and land cover. It has detailed information for each site as well as how sites rate nationally.